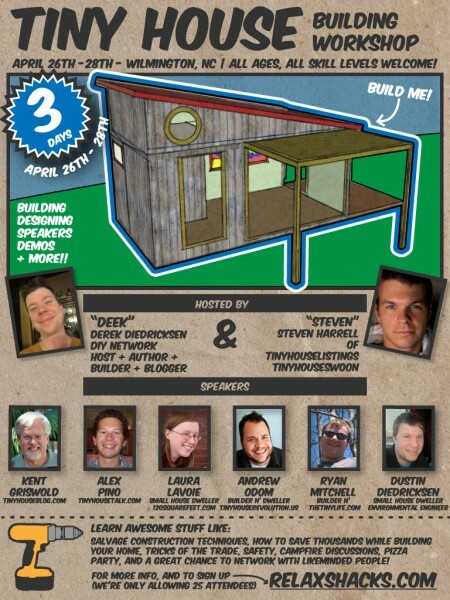 As I mentioned yesterday, Matt and I will be heading out to Wilmington, NC at the end of April to participate in what is turning out to be one of the largest gatherings of tiny house builders and bloggers in the country. I think this has a lot to do with the great Tiny House culture of North Carolina, but I'm probably biased. I think we live in the best state ever. I thought I would give you all a little insight on workshops and maybe some reasons you want to consider going to one or more in your area. A friend of ours had introduced us to the tiny house concept years ago after seeing Jay Shafer on Oprah. At the time his company, Tumbleweed Tiny Houses, was the only game in town. We already had some land building a tiny house seemed like a great idea, but how could we know it was the right decision. An answer smacked us pretty hard right on the head. Jay announced his first workshop east of the Mississippi - right here in Asheville, North Carolina. It was exactly the sign we needed. We signed up for the workshop that day. This was before we began building so I am thinking it was sometime in late 2008 or the beginning of 2009. It was before I started recording things, too, so I'm really not sure. The workshop was held in a small conference room at a hotel downtown and there were maybe 15 people, including Jay himself. It was a really intimate affair as we spent all day discussing tiny house building with everyone else in the room. We were immediately sold on the concept and bought the plans that day. Early last year, Tumbleweed was offering another workshop in Asheville. We were invited to speak about our experience building one of their tiny house designs. We met with the presenters, including the fabulous Pepper Clark, the night before we were scheduled to speak and asked how many people were at the workshop. We were expecting something similar to our first experience- around 15 people. The answer: "well, the room holds 100 people but it is standing room only." Now there are lots of options for workshops. Deek Diedricksen has hosted a few, including the upcoming one pictured above. The Tumbleweed Tiny House Company has several announced and Jay Shafer's newest company, Four Lights Tiny Houses, will be doing several as well. There is also the Yestermorrow fair in Vermont and Alex Pino of Tiny House Talk has recently announced a partnership of Dan Loche for a workshop in North Atlanta in May. The best part about most of these new workshops is the addition of hands on experience.While sitting in a hotel conference room talking about tiny houses is pretty neat, there is nothing like really getting your hands dirty. Honestly, I had never used a drill before building the tiny house so having a some hands on training with people who've done it before sounds like a great idea in retrospect. Heck, now I am someone who has done it before! The workshop experience was an important step to my own tiny house adventure. If we hadn't attended that event I wonder what we might have done. Everything fell into place for us at that moment and the tiny house concept felt right. 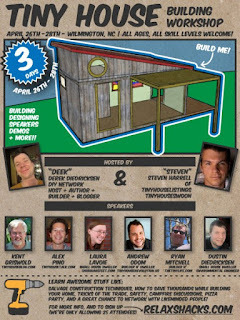 I recommend that everyone attend a workshop if they can and network with other tiny house builders and dreamers and take your own ideas to the next level. I am looking for this info.